The full folly of Newcastle United’s January transfer strategy has been highlighted with Montpellier now looking to sell top target Remy Cabella for almost twice what the Magpies offered. The 24-year-old was United’s choice to replace Yohan Cabaye in the winter but, having failed to meet the asking price then, he now looks set to be put beyond their reach. An injury to Franck Ribery saw Cabella promoted to France’s World Cup squad last week, and his club will now cash in, looking for at least £12m for him this summer. The Magpies could have had him in January if only they had upped their £6.5m bid. Montpellier chairman Louis Nicollin said of Cabella’s elevation: “I am happy because he is a great kid. “This also shows the quality of our academy and it is very likely I will go to see all the national team’s matches. Even if they had paid £12m for Cabella, who scored 14 goals in 37 appearances for relegation-threatened Montpellier in Ligue 1 last season, they would still have made £7m after selling Cabaye to Paris Saint-Germain. The £19m they got for the playmaker was a poor price, and went some way to costing Joe Kinnear his job as director of football. Newcastle failed to replace Cabaye at all and saw their form nosedive. 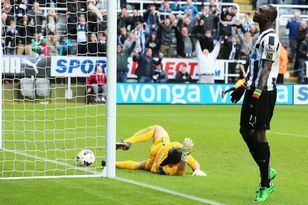 Nicollin’s new asking price and his antipathy towards the Magpies for their handling of the matter are likely to make Cabella unattainable to Newcastle as they look to rebuild after a season which started very well, but tailed off dramatically in the second half. Winger Ayoze Perez has joined and midfielder Jack Colback is expected to do likewise when his Sunderland contract expires at the end of the month. Meanwhile, Paul Dummett is adamant he is ignoring the furore which ended his season early. The Wales left-back was sent off for fouling Luis Suarez in the final match of the campaign, threatening the Uruguayan’s World Cup involvement. He received death threats on Twitter. “It was pretty bad but I have to try and ignore all that, concentrate on football and let it go over your head,” he said. “I didn’t think it was a bad tackle and at the time I was gutted that I was sent off. I look back and perhaps it was a bit reckless but I wasn’t trying to hurt him, I was just trying to stop him making a quick break.